A parliamentary report of 1777 recorded workhouses in operation at Market Lavington housing up to 24 inmates, and at Rowde for up to 13 inmates. County of Wiltshire: Allington, Alton Barnes, Beechingstone, Bromham (2), All Cannings, Bishops Cannings (2), Cheverell Magna, Cheverell Parva, Chirton, Chittoe, Devizes St James (2), Devizes St John the Baptist (2), Devizes St Mary the Virgin (3), Easterton, Earl Stoke [Erlestoke], Etchillhampton, Marden, Market Lavington, West Lavington (2), Marston, Patney, Potterne, Poulshot, Rowde, Stanton St Bernard, Stert, Urchfont (2), Worton. Later Additions (from 1880): Fullaway (1835-94), Roundway (from 1894). The population falling within the Union at the 1831 census had been 28,638 with parishes ranging in size from from Alton Barnes (population 138) to Devizes St Mary (2,589). The average annual poor-rate expenditure for the period 1833-35 had been £16,004 or 11s.8d. per head of the population. Devizes Union workhouse was erected in 1836-7 on a site at the north of Devizes. The Poor Law Commissioners authorised an expenditure of £6,700 on construction of the building which was to accommodate 400 inmates. It was designed by George Wilkinson who was also the architect of many other workhouses including those for the Malmesbury and Cricklade and Wootton Bassett Unions. His design for Devizes was a variation on the Commissioners' model cruciform or "square" plan published in 1835. The workhouse site is shown on the 1923 map below. There was an entrance and administration block at the south, behind which further accommodation ranges radiated from a central octagonal hub to create separate exercise yards for the different classes of inmate (infirm/able-bodied, male/female). 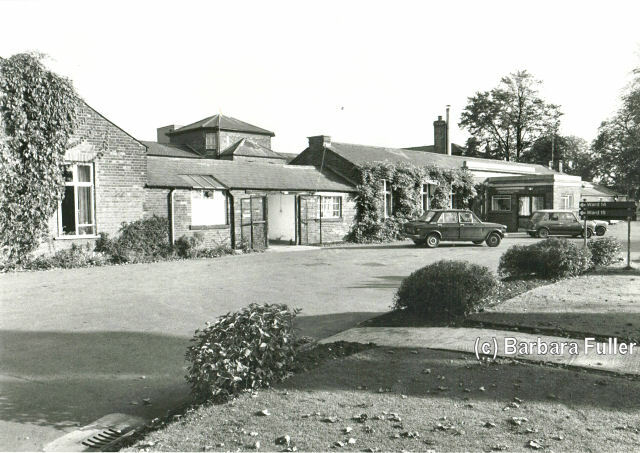 Devizes workhouse entrance block from the south-west, 1986. 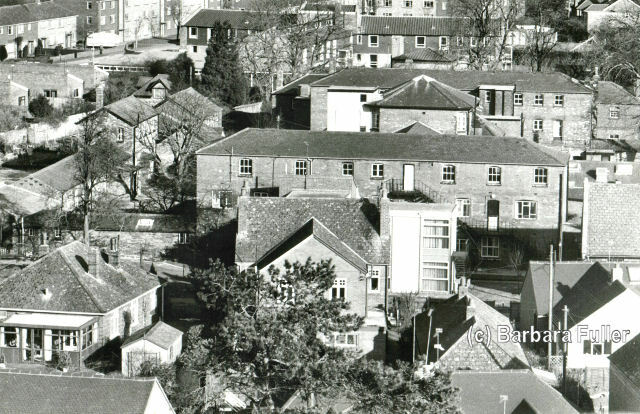 Devizes workhouse from the west (from St Mary's church), 1986. Devizes workhouse internal courtyard, 1986. A DESTRUCTIVE PAUPER.—A pauper named John Philpot was admitted into the Devizes Union Workhouse on Monday, the 6th instant, and, although very sullen, did not find fault with anything until Friday last. Between 8 and 7 o'clock to the evening of that day, he was, as usual, served with his supper, when he complained that it was not weight; and upon the porter assuring him that it was, he threw it on the floor with an oath, and, seizing a bludgeon used fur pounding oakum, commenced an attack upon, and completely smashed the whole of the windows in the able-bodied paupers' day-room, wood-work and all. The master and porter narrowly escaped the blows aimed at them. He afterwards took a broom, and walked round the yard, tearing off the wire lattice, and literally beat in the glass of every window within reach. So speedily was the damage done, that within a quarter of an hour, four hundred and thirteen panes of glass were destroyed. On the arrival of a constable he was secured, and lodged in the blind-house for the night. On Saturday be was brought before the mayor, who committed him to two months at the treadmill. An infirmary block was added parallel to the east side of the workhouse in the late nineteenth century. From 1904, to protect them from disadvantage in later life, the birth certificates for those born in the workhouse gave its address just as 7 Commercial Road, Devizes. The institution was renamed St James' Hospital in 1948 and was used as a geriatric hospital until around 1990. It is now totally demolished apart from one small outbuilding. A Red Cross centre and doctor's surgery now occupy one end of the site. The larger part of the site is awaiting redevelopment. 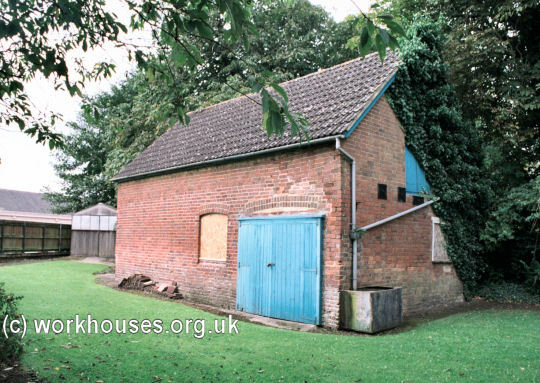 Devizes small surviving outbuilding, 2000. 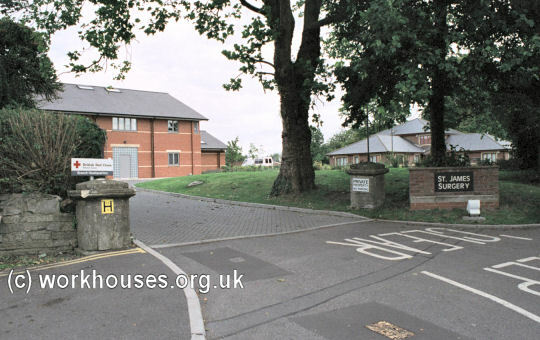 Devizes former workhouse site from the west, 2000. Wiltshire and Swindon Archives, Wiltshire and Swindon History Centre, Cocklebury Road, Chippenham SN15 3QN. Holdings include: Guardians' minutes (1835-1930, with gaps); Admissions and discharges (1899-1932); Births (1848-1933); Baptisms (1871-1932); Deaths (1866-1939); etc. 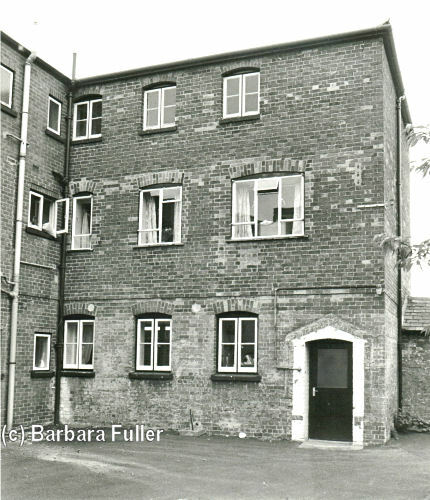 Fuller, Barbara A (1986) Changed Times — A Short History of Devizes Union Workhouse and St. James's Hospital, 1836-1986. Thanks to Barbara Fuller for the pictures of the workhouse buildings.